101225 - Up at the crack of dawn with 3 very excited little boys. 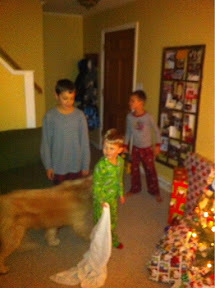 They opened their presents in turns, and were happy when others opened the presents they got for them. D vanished to the basement to build his HUGE LEGO set. I put together a Playmobil zoo for G and some big LEGO spaceship with J. With sore knees and hips I pulled myself up long enough to eat lunch. Then time for more presents... 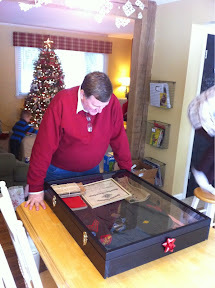 Here is a shadow box we all put together for GpaB of his fathers WWII Marine uniform, letters to home, awards and a newspaper from Dec 8th 1941. Very cool! 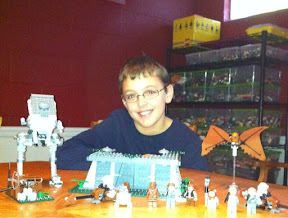 I then helped D finish up his Star Wars LEGO set. We got two more remotes and some games for the Wii, so we played a bunch of new games, ate some left-overs, and watched a movie. 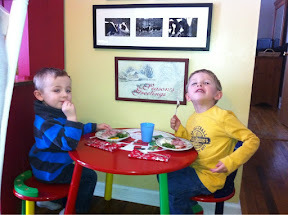 Then three very tired, very happy little boys off to bed. How many more wonderful days like these will I be lucky enough to have? Oh how lucky I am.